The 1842-O Small Date (PCGS Coin #5403) was recognized as a major variety as early as 1881, when it was catalogued in John Haseltine’s Type Table. During 2007-2008 the LSCC membership voted it number 6 on the list of greatest New Orleans seated coins. Though there isn’t too much to say about the 1842-O Small Date that hasn’t already been said at least once, I thought it might be useful to look in detail at how to attribute the issue. It seems, particularly at local shows, that ’42-O Large Date quarters are regularly labeled as Small Dates and priced accordingly. Obverse – One way to identify the obverse die is the size of the date, just as one would expect from the name. This is, however, far more difficult than it might seem without a Large Date in hand for direct comparison. Figure 1 shows the date of an 1842-O Large Date and Figure 2 shows the date of an 1842-O Small Date. 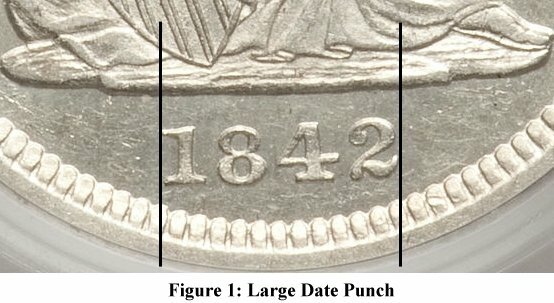 The size difference can be noted either by counting the number of denticles below the date or by noting where the date “begins” and “ends” with respect to the figure of Liberty. A quicker and equally reliable attribution point is the flag of the 1, shown in Figure 3 for the Large Date and Figure 4 for the small date. Note the differences in the flag of the 1. The Large Date has a longer flag that comes to a point; whereas, the Small Date has a shorter, stubbier flag. Reverse – Five of the six reverses known for the 1842-O Large Date have mint mark positions that are quite different from the 1842-O Small Date. 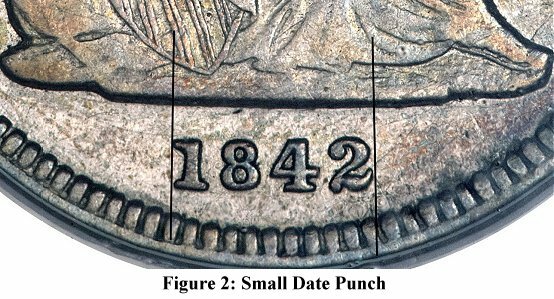 One Large Date reverse die has a similar mintmark position, making a quick check of mintmark position inadequate for identifying the Small Date die pair. The most reliable diagnostic is a die lump on a denticle near the olive leaves. 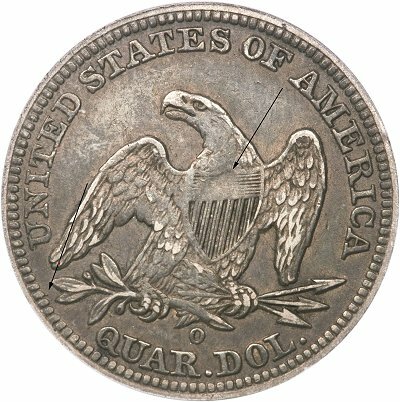 The lump is very prominent and is evident even on very low-grade coins (Figure 5). 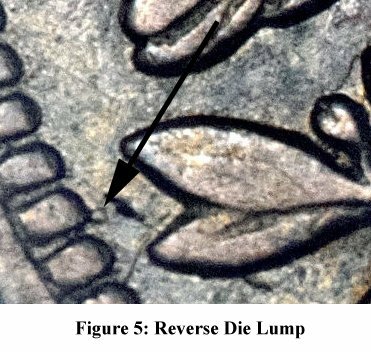 Another interesting variety of this reverse is the late die state (making up about 10% of the known examples) that has significant damage to the shield (Figure 6). Take care in buying raw examples of this variety. It is best to obtain them from a knowledgeable and reliable dealer; but if you are prospecting the local shows take a copy of Briggs1 with you, or a ’42-O Large Date coin for comparison, or maybe even a copy of this column. 1. Briggs, Larry. The Comprehensive Encyclopedia of United States Liberty Seated Quarters. Lima OH 1991. Images courtesy of Heritage Archives.